As I think back on my time in Berlin, I recognize the first few weeks were some of the most academically challenging of my life. It wasn’t so much a linguistic challenge, but rather the fact that I had a very difficult time shaking the city’s history as I walked up and down the streets. There is a blessing to knowing history in the fact that no matter where you go and what you do, you have perspective. In Germany, however, this historical perspective overwhelmed me at first – to the point that I could think of nothing else. Finding myself at Bebelplatz, I looked around the empty square aghast with people seemingly going about their normal, everyday business. Nearly 80 years prior, Nazis had thrown the works of Franz Kafka, Sigmund Freud, Heinrich Mann, Heinrich Heine, and Karl Marx into fires. An estimated 40,000 young people had congregated there in the night; watching the flames lapping up the millions of words and ideas written in those books and hearing the inflaming speech of the infamous Joseph Goebbels, the minister of propaganda. Another fact that I couldn’t seem to shake was the knowledge that in April 1945, the Battle for Berlin took place. During this particular battle, tens of thousands of children fought on the streets, willing to sacrifice their lives to ensure that Allied occupation of the city did not occur. As a young teenager, I had read Susan Bartoletti Campbell’s award winning book “Hitler Youth: Growing Up in Hitler’s Shadow” which made a profound and lasting impact on me. Although the book focuses exclusively on the stories of children caught up in the Nazi regime (as either supporters or dissenters), it begins with a quote from Adolf Hitler himself, spoken in Nuremberg in 1933: "I begin with the young. We older ones are used up . . . But my magnificent youngsters! Look at these men and boys! What material! With them, I can create a new world." By 1939, Hitler Youth organizations were mandatory for all young Germans over the age of 10 years with millions upon millions enrolled. 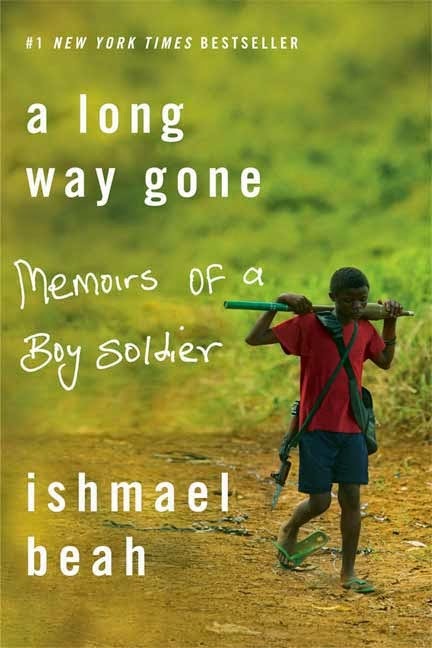 It was with this knowledge that I read the famed “A Long Way Gone: Memoirs of a Boy Solider”, written by Ishmael Beah, for my first book on the Western African nation of Sierra Leone. The cover of this book is probably well known to many of you bookstore-goers: a thin, young African boy wearing a dinghy red shirt and lime green cheap flip flops with holes in them - weighed down by weapons – walking through a thick and luscious green landscape. It is a very powerful image and one that particularly resonates with westerners – despite the fact that western children were used in warfare such a short time ago. The short narrative (only a little more than 200 pages) is equally powerful as the author discusses his experience transitioning from a village boy to displaced refugee to a child soldier, as well as the difficult process of his rehabilitation back into society. It is in one of these rural villages that the story of young Ishmael Beah begins: When visiting another village, he discovers that his family’s village was attacked by the RUF rebels. This is only the beginning of a wild goose chase for survival – as he joins forces with other young boys and flees from village to village, attempting to find their families and having to constantly flee from the AK-47s of the rebels. “I had passed through burnt villages where dead bodies of men, women, and children of all ages were scattered like leaves on the ground after a storm. Their eyes still showed fear, as if death hadn’t freed them from the madness that continued to unfold.” (page 49) This is a difficult part to read and takes up nearly half of his book. However, it is important, as it serves as a strong reminder of the innocence and the helplessness of these young children forced to survive on their own. Beah describes the horrors of becoming a child soldier. Although he was only thirteen at the time, he was joined by others – some as young as seven years of age. He shows how warfare quite literally took over his life. He passed his time watching Rambo movies (getting ideas which he would later use against other RUF soldiers – including other child soldiers) and “smoking marijuana and sniffing brown brown, cocaine mixed with gunpowder, which was always spread out on the table, and of course taking more of the white capsules, as I had become addicted to them. “ (page 121) Beah was promoted to a junior lieutenant due to his excellent service, as increasingly more of the government raids turned against civilian villages, instead of RUF, in order to capture recruits or supplies. The story of Ishmael Beah, including his rehabilitation through UNICEF at the end of the book, is extremely enlightening, and I highly recommend it. Although I appreciated the insights it provided into the topic of child soldiers, I was most impacted by its personal insights into the topic of warfare in Africa, which perhaps affects its everyday people more than warfare in other regions – due to its guerilla nature, use of human shields, and constant citizen recruits (which even includes children.) His story of victim and then perpetrator is certainly both compelling and disconcerting.